Italy has at least 20 wine regions, all with their own unique geographic and cultural characteristics. One of these is Alto Adige, a relatively small area situated in northwest Italy and bordering Austria and Switzerland. This region was once part of the Austro-Hungarian kingdom of the South Tirol and is has more Germanic character than Italian. This translates to wine as well where German and Austrian varieties such as Riesling, Gewürztraminer, Pinot Blanc, Müller Thurgau, Sylvaner, and Kerner. The region is also home to unique varieties such as Schiava (Vernatsch) and Lagrein. 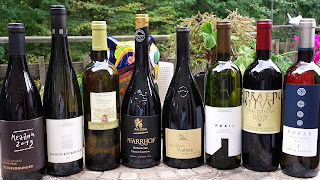 Karen MacNeil, author of the Wine Bible, conducts a twitter tasting called #SipWithKaren and Alto Adige was the topic for the most recent tasting. Participants received a generous eight wines to highlight the region's wine diversity. Castel Sallegg Pulvernai Pinot Grigio 2014 ($22)The winery has existed in it's current form when in 1851 Archduke Rainer of Austria purchased the castle and surrounding vineyards. Descriptor: Plenty of citrus, a fresh wine with some spice and refreshing acids. Founded in 1823, the winery has been passed down through five generations to Alois Lageder, who took a leading role in developing Alto Adige’s single vineyard wines. The Porer Pinot Grigio is produced from certified organic grapes from vineyards that are farmed according to biodynamic methods of viticulture. Descriptor: minerals and pears dominate the nose, followed by creamy stone fruit, and a saline driven acidic finish. Pinot Bianco has been cultivated in Alto Adige since 1852, with the first vintage of Cantina Terlano Vorberg Pinot Bianco produced in 1893. Pinot Bianco grapes account for 1,242 acres (9.85%) of AltoAdige’s total vineyard area. The vines for the Cantina Terlano Vorberg are situated on the south-facing slopes of Monzoccolo (Terlano DOC area). “Vorberg” translated into English as “pre-mountain” and describes the topography with 20-70% incline at altitudes between 1,400 and 3,100 feet. After fermenting the wine matures sur lie for 12 month. Descriptor: stone fruit on nose, continues on palate with white peaches; creamy texture; finishes with bright acids and a touch of saline. This is a winegrowers co-operative that was founded by 28 members in 1960 which has now grown to 300 active members. Sauvignon Blanc is a relative newcomer to Alto Adige, introduced 150 years ago. The grapes for this wine were sourced from selected vineyards within the Roman “Praedium” range. Descriptor: Surprising stone fruit mixed with citrus flavors; plenty of acids in the long finish. Founded in 1893, Cantina Andriano is the oldest winegrowers co-operative in Alto Adige, formed by growers surrounding the village. Descriptor: complex aroma of floral, honey, and spice with citrus, nuts, and more spice on the palate. Another winemakers co-operative hosting 400 members. This wine is predominately Schiava, Alto Adige’s most widely planted grape variety. Descriptor: deep cherry flavors, with both spicy pepper and sweet spices. Big mid-palate and acids at the tail. The winery is the 1986 merger of the Erste (“first”) wine co-operative (founded in 1900) with the Neue (“new”) wine co-operative (founded in 1925). Pinot Noir is known as Pinot Nero or Blauburgunder in Alto Adige. Although high in altitude, the Mezzan area receives the most hours of sunshine per day and enjoys some lake affect breezes and temperature moderation from nearby Lake Garda. Descriptor: Dark cherries throughout, with earthy minerals, spice, and big chewy tannins translating to a structured delicious wine. A monastery founded in the mid 1100s, with vineyards located in the north and central regions of Alto Adige. The later warmer region is home to reds like Lagrein, the indigenous grape that was first mentioned in Alto Adige in 1318. The winery possesses over 850 years of winemaking experience, most likely many with this tannic grape. Descriptor: the wine is bold and savory with an earthy, tobacco, dark fruit profile; plenty of texture; and finishes long and chewy.